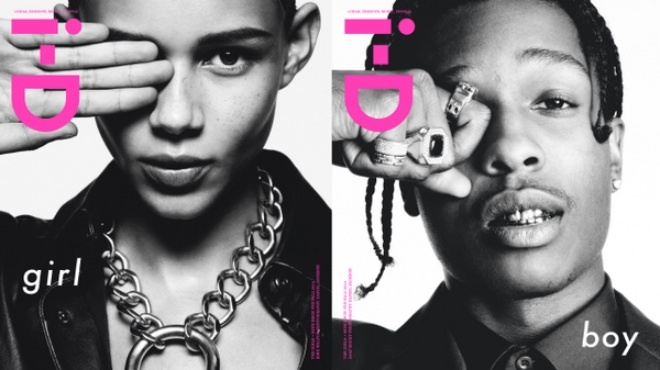 Jam packed with bright young talents we’ve been watching, i-D presents two covers starring A$AP Rocky representing the boys, and Leona ‘Binx’ Walton leading the pack for the girls. launching the Pre-Fall 2014 edition of i-D: The Girls and Boys Issue explores what it means to grow up as boys and girls in the world of today. Hot Hot Cover girl + FashionDailyMag fave Binx Walton, one of Tennessee’s hottest exports fashion’s most sought-after models, has a CV full of campaigns for Chanel, Balmain, Coach and Céline . On the boys’ cover, A$AP Rocky has a #1 album under his belt and two more on the way, and is fast cementing his position as one of the musical voices of his generation. Throughout decades, i-D has built its reputation as a consistent source of inspiration in fashion culture. It began as a fanzine dedicated to the street style of punk-era London in 1980, and quickly earned its position at the vanguard of fashion and style, always abiding by the premise of “Originate. Don’t imitate.”Constantly reinventing itself, as with the new digital platform, i-D continues to encourage creativity, which is why after more than 30 years, its editorial content still manages to surprise and inspire. See more from i-D at i-D.co.